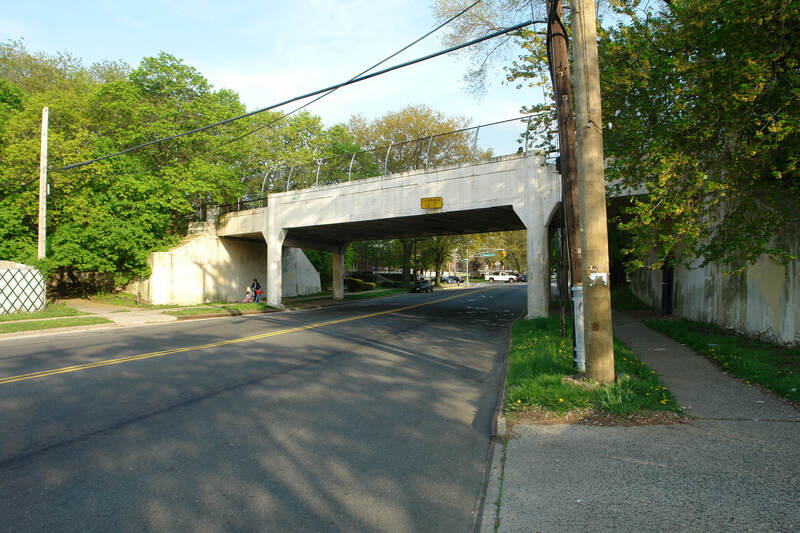 A total of 65 Motor Parkway bridges were built from 1908 to 1926 ...a pioneering concept to eliminate grade crossings for an automobile road. There are four types of Motor Parkway bridges; over crossroads (parkway bridges), under crossroads (highway bridges), over railroad tracks (railroad bridge) and, as part of right-of-way agreements, to connect farmlands (farmway bridges). This series will document these bridges beginning at the Western Terminus in Fresh Meadows, Queens to the Eastern Terminus in Lake Ronkonkoma. Today's focus: The Rocky Hill Road (now Springfield Boulevard) Bridge. By the summer of 1912, the Long Island Motor Parkway had been extended into Queens with the new Western terminus at Rocky Hill Road. 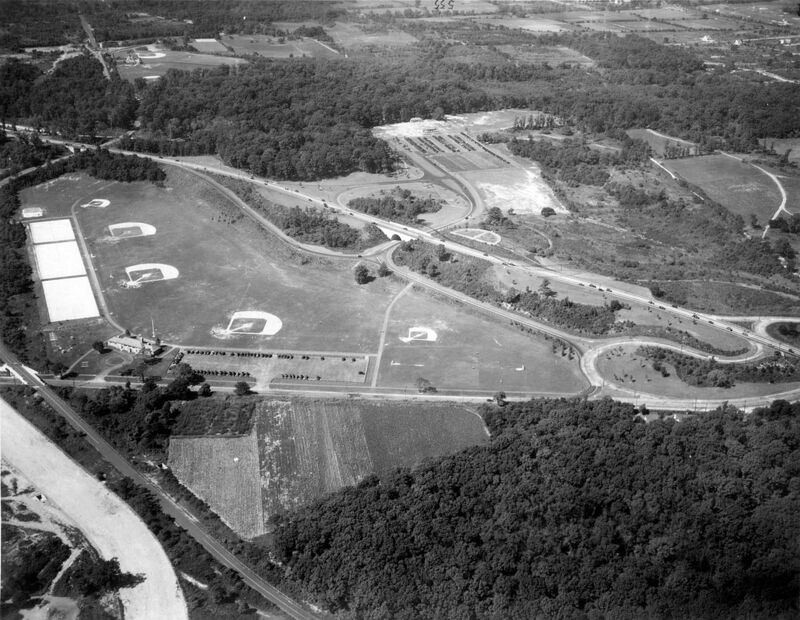 This aerial shows the section of the Motor Parkway from Winchester Boulevard (far right) to Rocky Hill Road (far left). 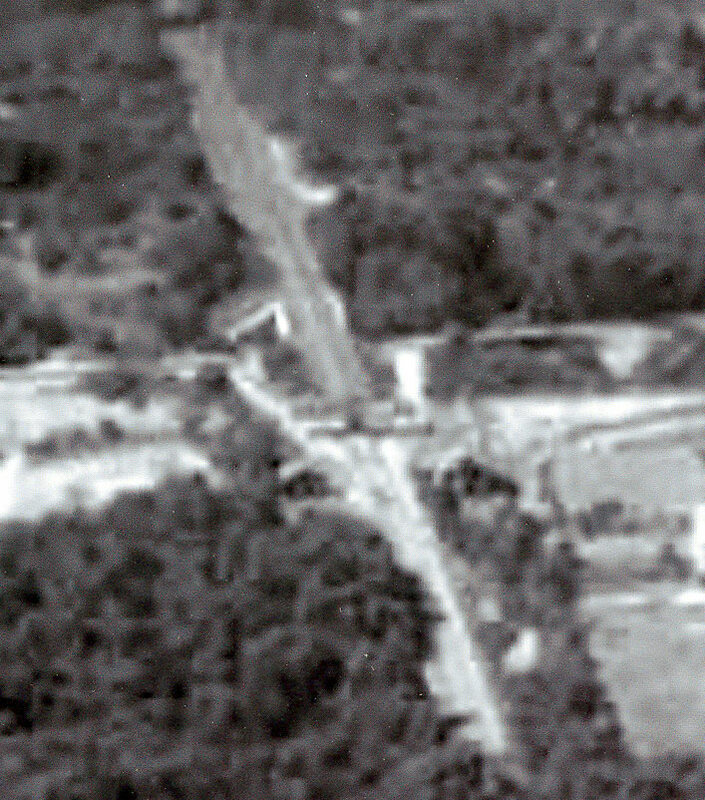 A close-up of the aerial shows the Western Terminus at Rocky Hill Road. 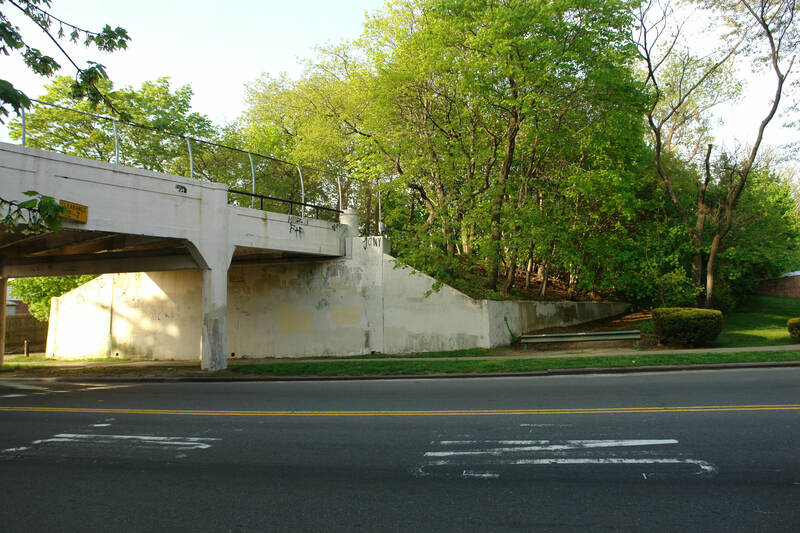 The Motor Parkway bridge over Rocky Hill Road was built in late 1924. Compare this 1928 survey with the above 1924 aerial. 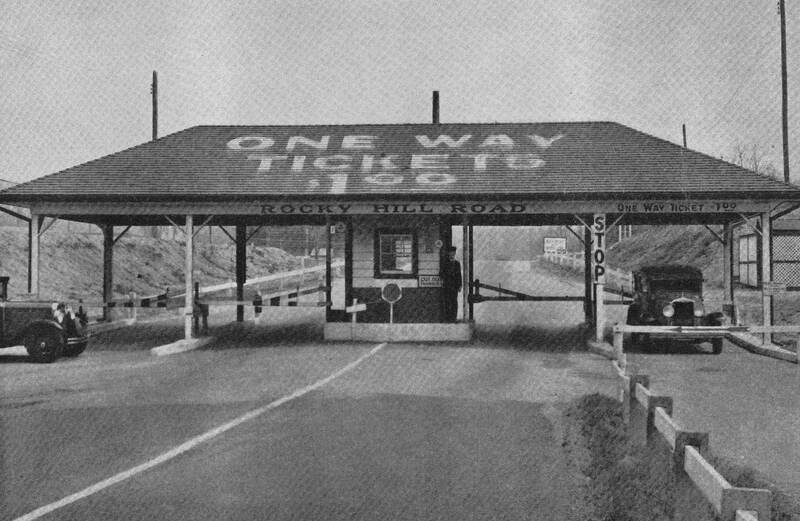 The Rocky Hill Road Toll Lodge officially opened on July 1, 1928 and was located approximately 600 feet east of Rocky Hill Road Bridge. Although the toll receipt said "Rocky Hill Road Lodge", it was clearly only a toll booth across both lanes of the Motor Parkway. 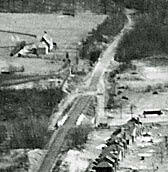 This aerial photo of Alley Pond Park shows construction of the extension of Union Turnpike in the lower left corner. Just above the turnpike is a section of the then still-active Long Island Motor Parkway with its bridge over Winchester Boulevard. Running diagonally across the photo is Grand Central Parkway. Note: The many cars on this toll-free road as compared to the completely empty Motor Parkway. Further proof that the Motor Parkway was in deep financial trouble in 1937. Finally, the upper left section of the photo shows the Motor Parkway near Rocky Hill Road. Let's take a closer look. These two 1937 images (left looking west and right looking east) again show the Rocky Hill Road Bridge and the toll booth. Note the entrance and exit ramps leading off Rocky Hill Road to the Motor Parkway.The Rocky Hill Road Bridge was the only Motor Parkway bridge to have two ramps. 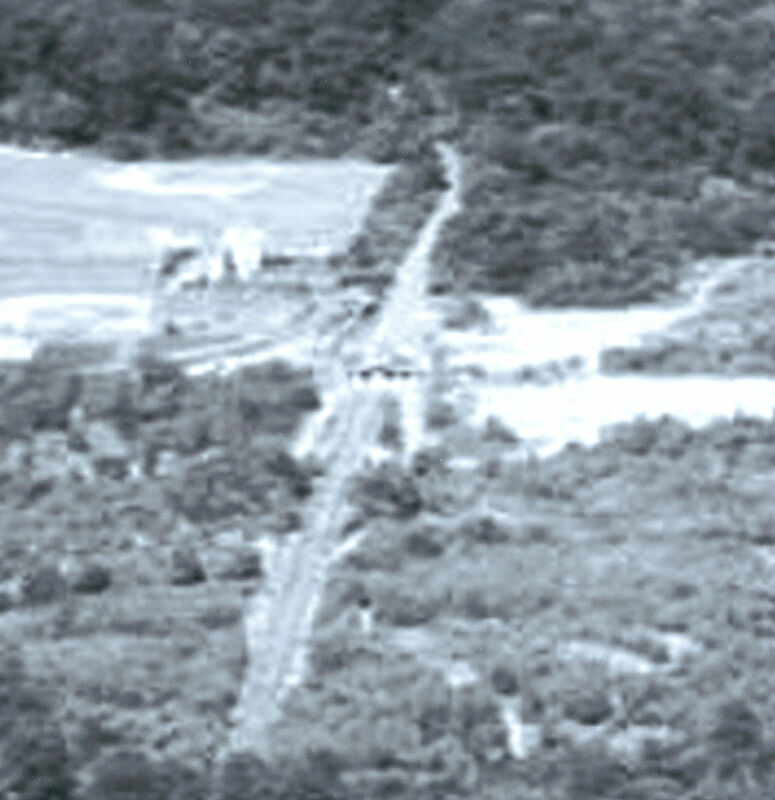 Another aerial view of the Rocky Hill Road Bridge and the Rocky Hill Road Toll Lodge, further highlighted by its shadow. Within three years after the closing of the Motor Parkway, the toll lodge had been taken down. 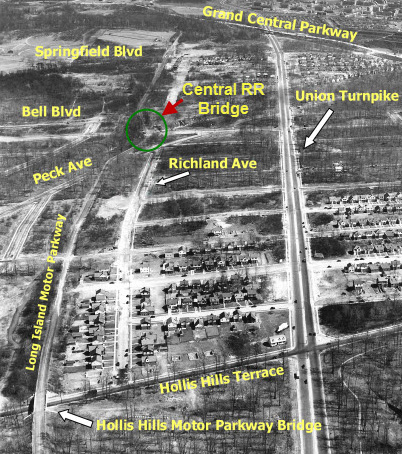 Although the toll lodge and even the Rocky Hill Road name are long gone, the Springfield Boulevard Bridge remains standing as one of the seven extant Motor Parkway bridges. The bridge functions as part of Brooklyn-Queens Greenway. This is a current view looking south-east. A view of the bridge looking north-east. Note the ramps still exist, now serving cyclists and pedestrians rather than cars. A close-up of the ramp. The 1924 imprint on the bridge. Looking west towards the bridge at the location of the Rocky Hill Road Lodge. Note the ramps on both sides of the road.